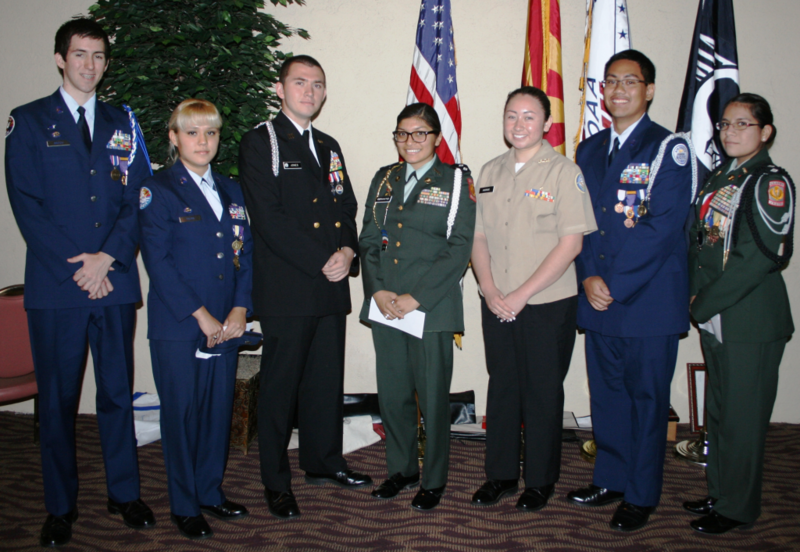 Seven JROTC Scholarship awards were presented this year during the Chapter luncheon at McCormick Ranch Golf Course on Saturday, the 19th of May 2012. There were three $500, two $1,000, one $1,500, and one $2,000 award. The $2,000 scholarship, named after our long-time Scholarship Chair, the late Colonel Ron Worthington, was presented to Destiny Cervantez of North High School Army JROTC. TriWest Healthcare Alliance, our most ardent supporter, donated $1,000 to the scholarship fund this year. Left to Right: Sean Brock, Sandra Day O'Connor HS; Sherry Palma, Shadow Mtn HS; K. Dane Jones, Moon Valley HS; Destiny Corvantez, North HS; Maria Andrade, Cortez HS; Jeffrey Alcantara, Deer Valley HS; and Analy Benitez, Central HS.